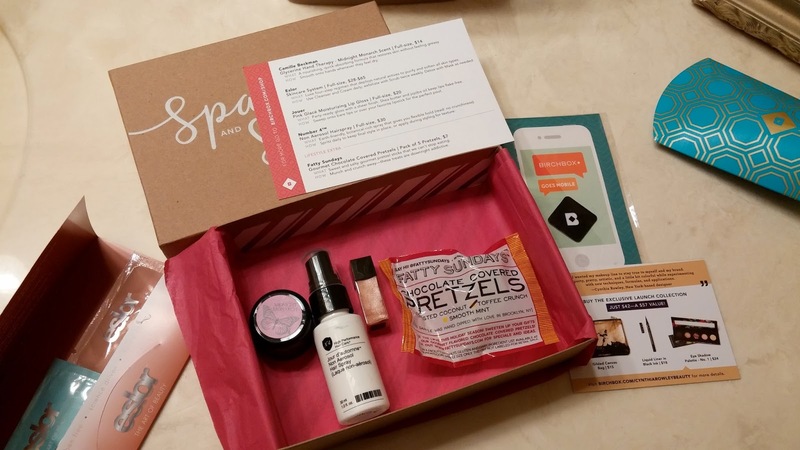 Do you have a monthly subscription to Birchbox? Ipsy? Julep? 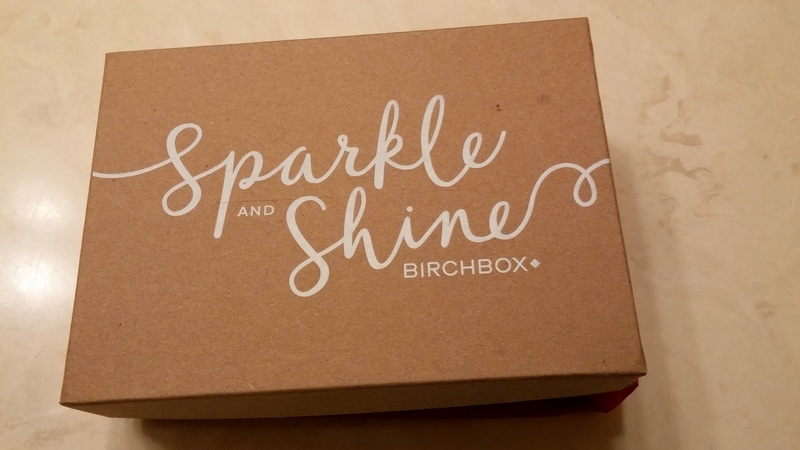 I have had a Birchbox subscription for a while, maybe almost two years now? Last month was my first Ipsy package, but I don't have a Julep account. I wanted to write a little review so that it could help me see the differences. I thought I would do both of them for three months and then make a decision. I love products and trying new things and I think this is a great way of doing it. Both subscriptions are $10 a month including tax and shipping. Both subscriptions get charged the first of the month. First up, December Birchbox. The theme this month was sparkle and shine. Eh a little shine a little sparkle but I wasn't overly excited. I LOVED the lip gloss, and I am thinking about ordering the full size, my problem is, I have a TON of lip glosses. But I think when you find one you like you go with it. The lip gloss is Jouer Moisturizing Lip Gloss in pink glace. It is $20 for full size. I really like it a lot. I find some of my glosses are too sticky, or actually dry my lips out, this one doesn't do either of those. The Midnight Monarch body butter, smells WONDERFUL! And with the winter we are having here, it is definitely needed. I have been using Bath and Bodyworks Aromatherapy body creams which I really like. I have the energy, stress relief and sleep and they all smell wonderful. Maybe if one of those runs out? Number 4 Non Aerosol Hair Spray. I haven't used this yet, I am an aerosol girl, it just holds my hair better. 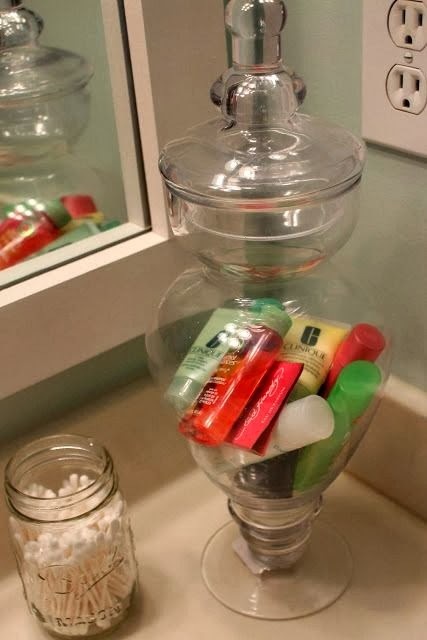 But recently I saw this on Pinterest and thought that it would work great in our guest bathroom. I already have this jar, figure it will be a good use of it. This is an item that will wind up in the jar. I have never used Eslor products before, but they are reasonably priced and I am curious to try them. My moisturizer and reconstructing serum that I currently use is Allgenist, and that was a Birchbox sample a while back. The last item was a chocolate covered pretzel, just a bite, but it was tasty. Okay, now onto Ipsy. 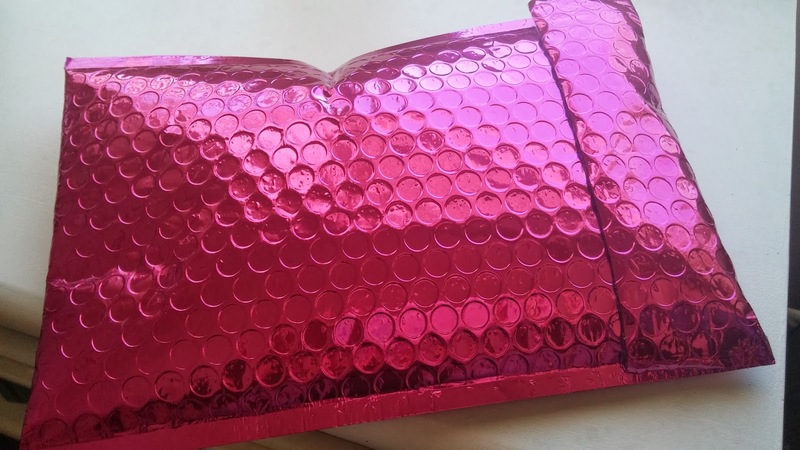 It came in a bright pink sparkly package, that is fun just to start with. This month had a celebration theme. 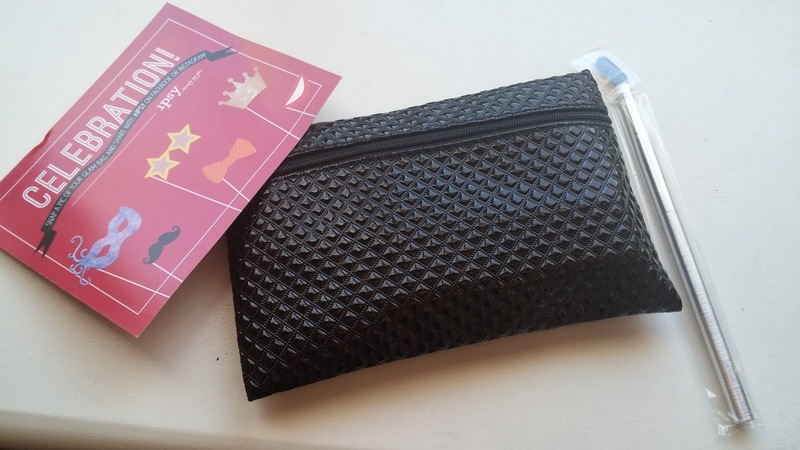 The one thing that I love about the Ipsy subscription off the bat is that everything comes in a cute little bag. This months bag is perfect and fits right into my pocketbook. Something else that I really like about the Ipsy subscription is that they send full size products. I really like the colors of the eye shadow, and even though it isn't the full size, it is a good representation of their colors. 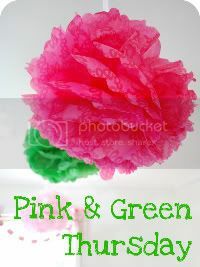 These are regular colors that I wear and I really like the product. The Bombshell Stick, is fun. The color is perfect for me, sunset. I have had samples from Benefit, of an all over stick, but I like the Bombshell stick and color better. One of the other great bonuses in having these subscriptions is that you usually get a discount off of the product for the month. Bombshell is offering 40% off and a free blush. The sticks are $16, great deal! 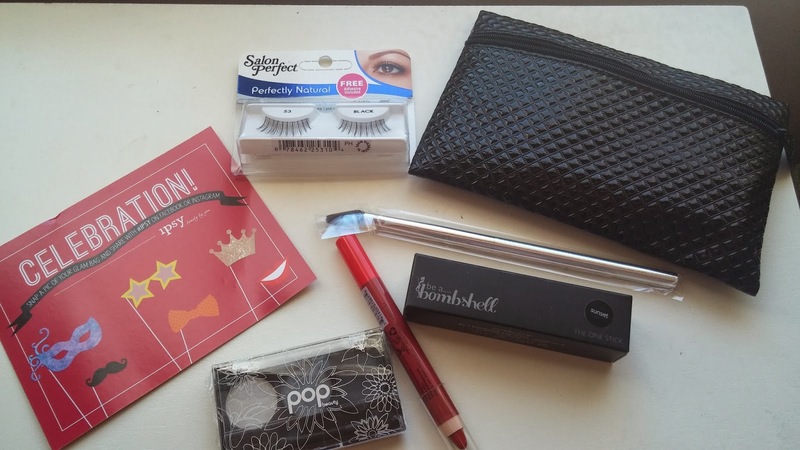 The Mirabella Beauty eye shadow brush was by far my favorite from both subscriptions for the month. I am already using it every day with my Naked color palettes. It is the perfect size and consistency for brushing on that base coat. The eye blender brush is $27 and the discount this month is 30% off, they have some great brushes. I have never worn or even put on false eye lashes before, but that is NOT going to stop me. I just want to have a reason to wear them of course. These are from Wal-Mart and since I am not a Wally World shopper, but I am looking forward to giving them a try. A little glam never hurt anyone! The last item was a lip pencil from J. Cat Beauty. I am not a huge lipstick wearer, but when I do wear it, this will definitely come in handy. They are offering 30% off any item this month, not a bad deal. Overall, so far I think I like the Ipsy subscription a little bit better, but I will reserve judgement until the next couple of months. Cannot wait for the January boxes. This time of year, being stuck inside, especially here in Minnie when it is so cold, it is a good time of year to experiment with new products.